Tuesday May 12th 1896 I went down town early this morning to take in marketing and get things needed. I sewed all the afternoon. The boys are busy plowing. It is ten years today since Will and I were married. Wednesday May 13th 1896 I put out more little chickens. I have had more than a hundred hatch this week. I am sewing every spare minute on my dress. Thursday May 14th 1896 I neglected the house work all I could today and finished my serge dress I am making over. There was a rain this forenoon that drove the boys from the field and Will went to town before dinner. 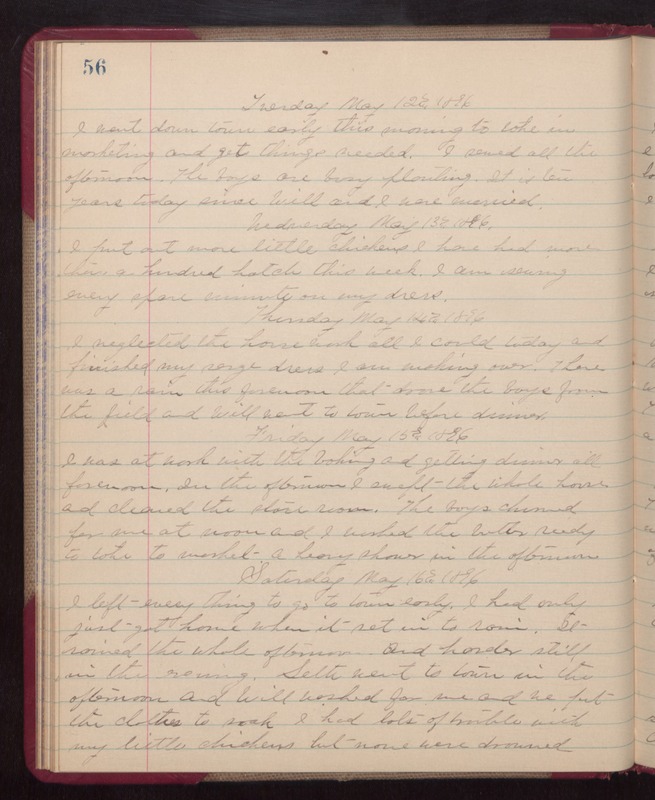 Friday May 15th 1896 I was at work with the baking and getting dinner all forenoon. In the afternoon I swept the whole hose and cleaned the store room. The boys churned for me at noon and I worked the butter ready to take to market. A heavy shower in the afternoon. Saturday May 16th 1896 I left everything to go to town early. I had only just got home when it set in the rain. It rained the whole afternoon, and harder still in the evening. Seth went to town in the afternoon and Will washed for me and we put the clothes to soak. I had lots of trouble with my little chickens but none were drowned.